Creative tearing and paint splashing starts off this all new “Loosen Up Workshop.” Also you will learn how to begin a new fresh body of work with your own artistic voice and point of view. Think “artist retreat,” producing a body of work, a series of paintings or your conceptual solo show. Robert Burridge, along with his famous daily handouts, demos and lectures, helps and guides you to paint the way you have always wanted to paint. Daily, you can expect warmup paint sketching, brief painting and lecture demos, constructive critiques and plenty of time to work on personal projects. Come prepared to paint your stuff! Robert Burridge is a noted international award-winning Industrial Designer who, after twenty-five years in the corporate design world, has focused his life to painting everyday. 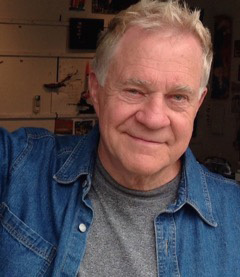 Burridge attributes his success to his education from the University of the Arts in Philadelphia, his stint as an adjunct professor at Cooper Union School for the Advancement of Science and Art in New York City, and in 1966, his Fluxus art performances with Yoko Ono, Nam June Paik, Jim McWilliams and Charlotte Moorman. He is much sought after as juror, lecturer and workshop instructor. 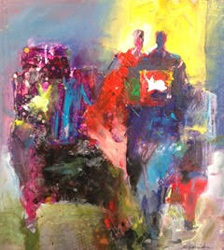 Also, Burridge is a featured artist-mentor for Master Workshops in France, Italy, Mexico, Bahamas, Cuba and Guatemala. Robert is the Honorary President of the International Society of Acrylic Painters and Signature Member of both the ISAP and the Philadelphia Water Color Society. He is a recipient of their highest and most prestigious award, the Crest Medal for Achievement in the Arts. Currently, his popular work hangs in the permanent collections of international embassies, corporate galleries, art colleges as well as television and entertainment personalities. The San Luis Obispo Museum of Art curated fourteen of his abstract paintings for his first solo museum exhibition, which led to his second major solo exhibition of seven foot abstract charcoal drawings. The Elverhoj Museum also invited and exhibited Burridge's personal collection of his seminal paintings from past exhibitions of twenty years. Workshop is full. If you would like to be on the Wait List, please contact SDWS at sdwsregistrar@gmail.com.